With the recent debut of the brand new DCI.org Web site, several new features are available to assist fans with gathering information when viewing information about Drum Corps International performing units. The new and expanded corps pages are loaded with up-to-date news and media for your favorite corps. 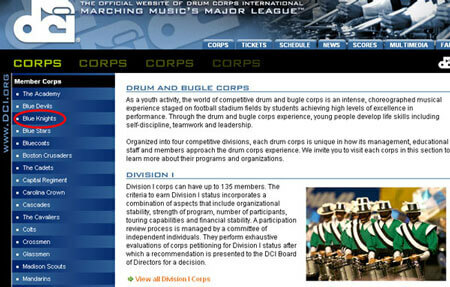 First click on the "CORPS" tab at the top of the web site. You will see all the Division I corps in the left-hand navigation bar. When viewing an individual corps' page, you can see the group's upcoming performance schedule, latest scores and news, contact information, a description of the corps, and a video clip from last season's show. On the left-hand side of each corps page, there is a navigation bar with various links to help you find anything you need to know about that corps. Click on any of the "About" links to find the latest news about that corps, sign up for RSS feeds, buy corps merchandise and visit the corps' Web site. 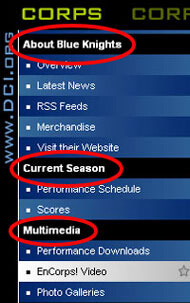 The "Current Season" links allow you to see performance schedules and find the latest scores from this year. You can also click on any of the "Multimedia" links to purchase audio files from any World Championship performance since 1972, subscribe to view summertime live WebCasts of select events, and to look at corps photo galleries. If you are a part of Drum Corps International's Fan Network as a Platinum Member, you will receive discounts on all audio purchases, complete access to all LIVE WebCasts throughout the summer, watch EnCorps! videos of your favorite corps, and much more! 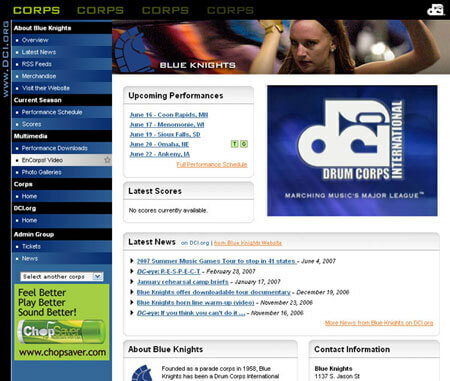 These new corps features, and DCI.org's Fan Network Platinum Membership, are designed to optimize your experience with DCI.org, so you can have the most up-to-date and reliable information and multimedia for your favorite corps. Enjoy!